The Shadow-Caster SCM-10 LED Underwater Lights are a single color underwater LED light that comes in 5 vibrant colors. Bimini Blue, Ultra-Blue, Aqua Green, Great White, Cool Red. At 10″ long, 2.38″ wide, and only 1/2″ thick, the SCM-10 is Shadow-Caster’s largest boat light. It is also the brightest. The SCM-10 puts out up to 3,100 lumens of light while using only 3.5 amps at 12 volts. Boating is tough on lights. From the pounding of waves to the corrosive effects of saltwater to the sudden high voltage spikes that plague marine electrical systems. Boat lights must handle severe abuse. Every part of a Shadow-Caster light is designed to withstand the severe abuse of the marine environment. LED lights are extremely shock resistant. They are immune to the tremendous forces created by pounding waves. 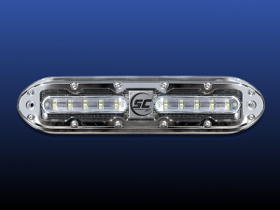 Shadow-Caster SCM series lights are made from 316 Stainless Steel. 316 Stainless Steel won’t stain, pit, or corrode even in saltwater. The stainless steel housing also aids in removing heat from the LEDs allowing them to shine brighter and last longer. High Voltage Spikes plague marine electrical systems. Every time you start your motor or a pump or other electronics turns on or off a spike of high voltage can shoot through your electrical system. This can damage poorly protected LED lights causing them to fail. Shadow-Caster LEDs use only the most advanced electronics to protect their lights. Advanced electronics automatically disconnect Shadow-Caster LEDs if a voltage spike or reverse polarity is detected. Thermal Protection electronics further protect the lights from overheating. Shadow-Caster LEDs are more than just the toughest lights in the water they are the best looking as well. Great looking surface mount design that is only 1/2 an inch thick. 120 degrees light spread floods the water with light. There are three ways to control your SCM-10 lights. Through the power toggle switch. 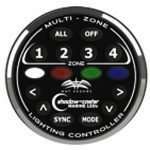 By installing a Shadow-Caster SCM-PD-WC wireless controller. The toggle switch is included in your order. It allows you to turn single color lights on and off. SCM-PD-WC is a power distribution box with integrated wireless control. A wireless Key FOB allows operation of the lights from anywhere on the boat or from within 100 feet of the boat. Single color or multi color Shadow-Net enabled underwater lights. Single color or multi color Shadow-Net enabled deck lights. Centurion Enzo 216 looks with two Shadow-Caster SCM-10 LED Underwater Lights in Bimini Blue.